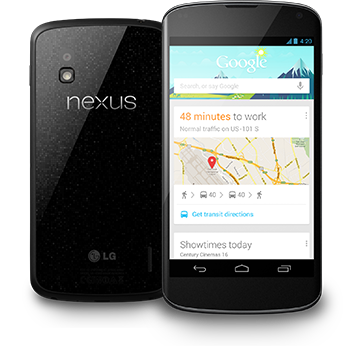 It seems Apple aren’t the only company capable of creating a buzz when it comes to phones, with the Nexus 4 from partners LG and Google selling out in various locations in the first few hours. We’ve already reported on the outstanding turnout for the Nexus 4 launch inAustraliaand now in the US, UK and other European areas we are seeing quick sellouts of the device. The Nexus 4 starts at a very attractive non-contract starting price of $299 for 8GB’s of on-board storage. You can get the 16GB version for $50 more if you’d like extra. With this, you get most everything a flagship phone is expected to have, a very high-res screen, new Android 4.2 operating system, good camera, amongst other features. One problem for US customers was the lack of 4G on the phone, while 3G can still get 42mbps in certain areas at certain times, the normal speeds are between 2 – 5mbps. This is rather poor for users on 4G networks that normally give them up to 70mbps and deliver a faster overall pace on the internet and on web apps. Even with this lack of 4G, it hasn’t stopped millions of customers in the US and worldwide buying the new Nexus 4 from the Google store. UK buyers said that the website was seeing quite slow performance when the phone went on sale. We are unsure how many units Google actually intended for launch, although we expect the number was high to coincide with the low-pricing. Right now we are seeing the Google Nexus 4 currently unavailable for pre-order with the ‘coming soon’ next to where you would purchase it. We believe there will be more stock in the coming weeks. Google are looking to bring a whole family of Nexus devices this time, with the Nexus 7 upgraded and the Nexus 10 making a new ecosystem of mobile devices. We are just wondering when the Chromebook will be changed to the Nexus 13.5 to finish the lineup.